Echoing the Pentagon, Brett McGurk, the special presidential envoy for the U.S.-led coalition against ISIS, noted that although the terrorist group only controls one percent of the territory it once held, the jihadi organization’s “clandestine cells” will continue to pose a threat indefinitely. Even as the end of the physical caliphate is clearly now coming into sight, the end of ISIS will be a much more long-term initiative. … Nobody working on these issues day to day is complacent. Nobody is declaring a mission accomplished. Defeating a physical caliphate is one phase of a much longer-term campaign. ISIS’s last stronghold sits in Syria along the country’s border with Iraq. “I think it’s fair to say Americans will remain on the ground after the physical defeat of the caliphate, until we have the pieces in place to ensure that that defeat is enduring,” he responded. Acknowledging that ensuring that U.S.-led coalition gains are enduring is a long-term effort, McGurk predicted that the “conventional fight” against ISIS will be over in “a period of months,” not years. Nevertheless, he insisted U.S. troops will remain in Syria after the complete fall of the physical caliphate. We have multiple objectives in Syria. … The military objective is the enduring defeat of ISIS. And if we’ve learned one thing over the years, enduring defeat of a group like this means you can’t just defeat their physical space and then leave; you have to make sure the internal security forces are in place to ensure that those gains, security gains, are enduring. So the enduring defeat of ISIS means not just the physical defeat, but make sure that we are training local security forces. So that will take some time. We also have other interests in Syria. … We want to see a resolution to the Syrian civil war. … And we also want to see the removal of foreign forces from Syria, particularly the Iranian-commanded and proxy forces from Syria. 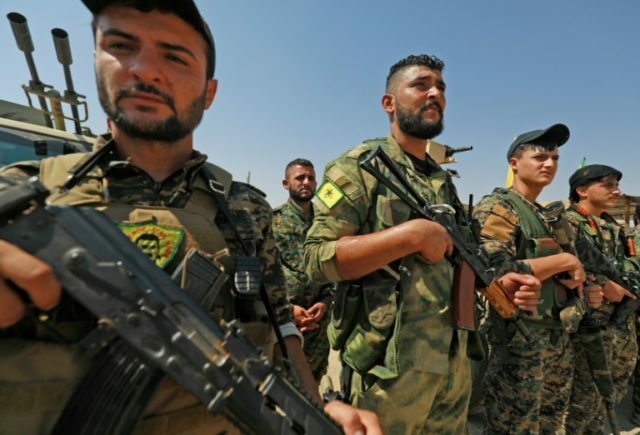 The U.S.-backed Syrian Democratic Forces (SDF), an alliance led by the Kurdish People’s Protection Units (YPG), moved into ISIS’s last enclave over the last 48 hours, McGurk revealed on Tuesday. ISIS has lost all territory it held in Iraq and remained in control of only one percent of [the] territory it once held in Syria. However, the DoD and a report produced by a United Nations Security Council monitoring committee stated that an effective clandestine ISIS organization has moved underground and is acting as an insurgency in both countries. While the DoD reiterated its position that its mission remains the “enduring defeat” of ISIS, U.S. officials issued statements this quarter regarding Iran and Syria’s ongoing civil war that raised questions about the duration of U.S. troops in Syria. ISIS still has “a couple thousand very hardened fighters” in the area it holds, the U.S. envoy said. Former U.S. President Barack Obama launched the U.S. military campaign against ISIS in 2014.